If you thought florals and flowers were just for the spring and summer, then you were wrong. This winter flower power is in full force with winter florals being a huge trend on and off the catwalk. The floral look has adapted itself for the colder weather by combining brightly coloured flowers with black. At Matthew Williamson, graphic primary coloured flowers covered fabrics and floral embellishments covered this black dress with stunning effect. 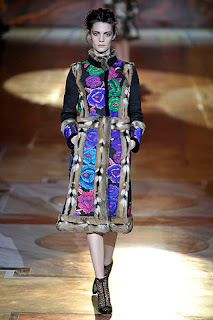 At Roberto Cavalli, deep purple, blues, green and red flowers were combined with black for a bright and refreshing look. If you would like to add a bit of colour to your winter wardrobe the winter florals trend is a great way to do so. Try accessorising a black outfit with brightly coloured handmade flower jewellery or corsages. This is also a great way to accessorise a little black dress. 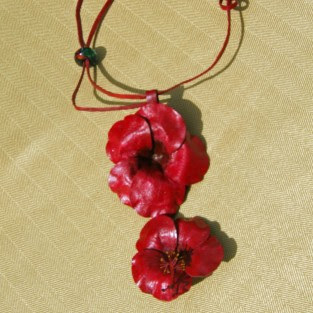 I love this red leather Hibiscus necklace.